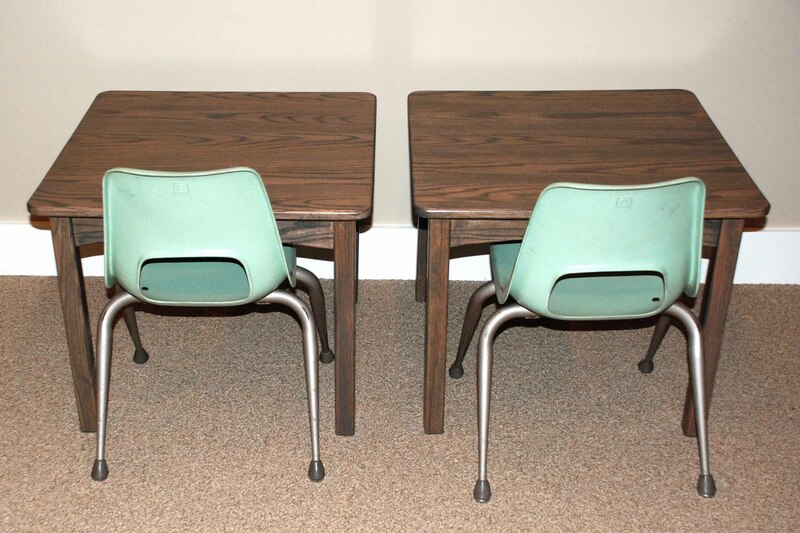 My dad made me these awesome little tables for the playroom in my basement. They won’t really be used for a while yet, seeing as Breckin’s only 9 months old, but I wanted to get them finished up and in the room just so I could check off something on my list of to-dos. 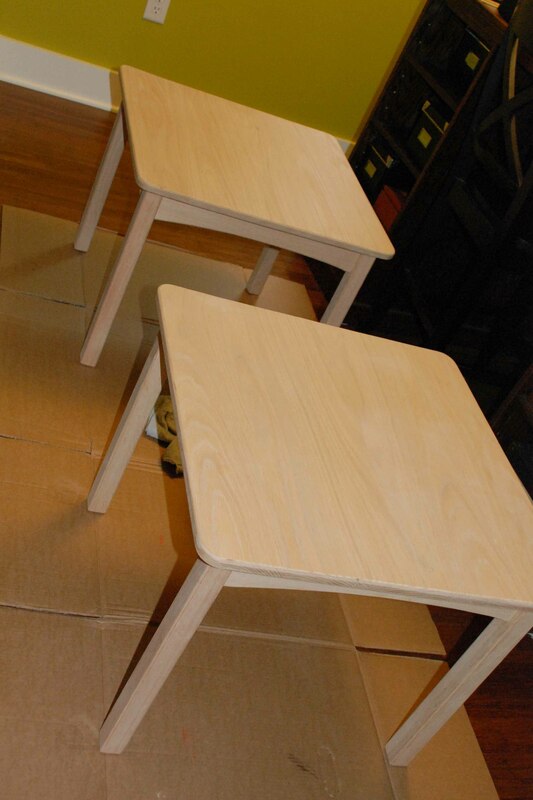 Well, my dad had made me very similar awesome tables for my living room when we bought our house four years ago, and I did the same kind of technique on them and I thought I’d share. So I decided to stain them a color. But finding a colored stain is nearly impossible, especially when you’re in search for a specific color. So I decided to buy an oil based paint and thin it out with mineral oil/paint thinner and use it like a stain. 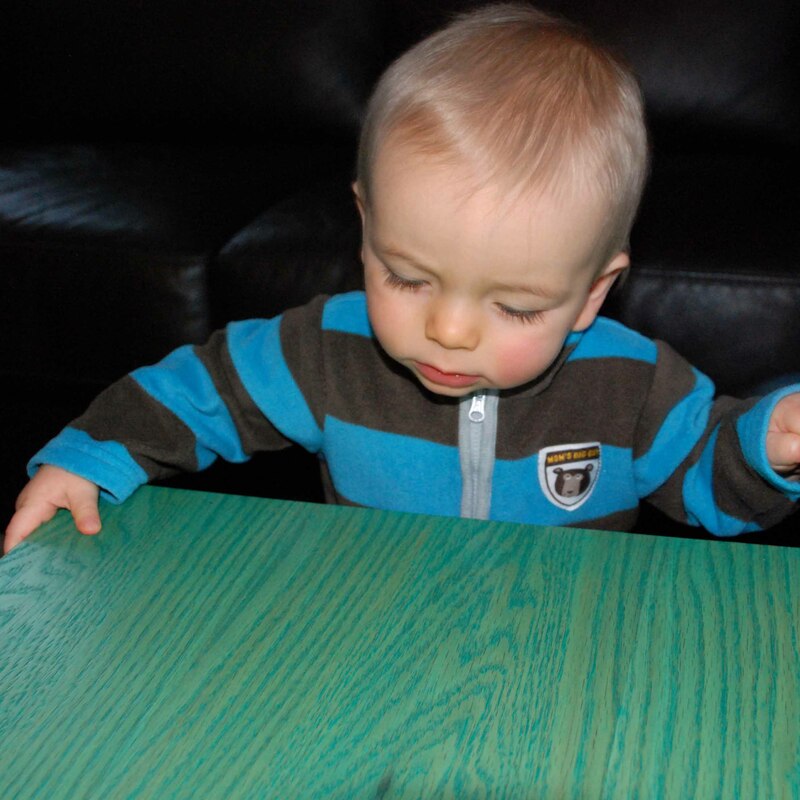 This is the table that I stained in our living room – not a wonderful shot, but you get the whole color stain idea. Well the tables down stairs in the playroom I really didn’t want to do another color, but more of a driftwood/ash/teak wood color. ok ok… I don’t know if that really makes sense. But I wanted a neutral medium grayish color. I’m sure that clears it right up. Well no such luck finding a stain that met my criteria, so I opted to go with the paint route again. -Oil based clear coat (again, make sure this is oil based as well, so go with the oil based paint). -Basic paint supplies, brush, rag, sandpaper.. etc. Also, another note on the oil based paint thing. Good luck finding oil based paint in a big box store. Don’t waste the trip – go directly to a good, true paint store. Around here it’s Sevens or RepcoLite. Apparently, the laws have changed and the restrictions on oil based paint have increased, so most of the lines that the big box stores carry just opted not to produce it anymore. Start out with your bare wood. 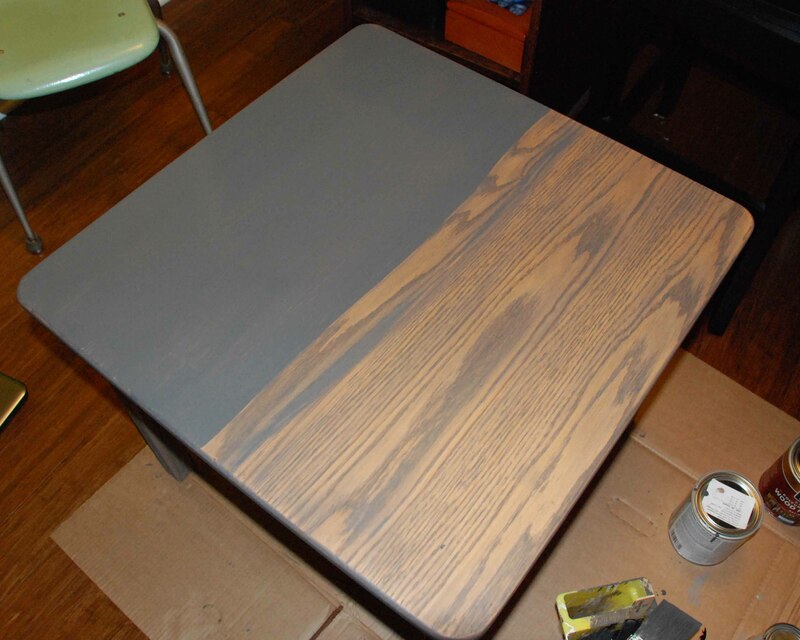 Whether you’ve sanded something to refinish it or built it from scratch. 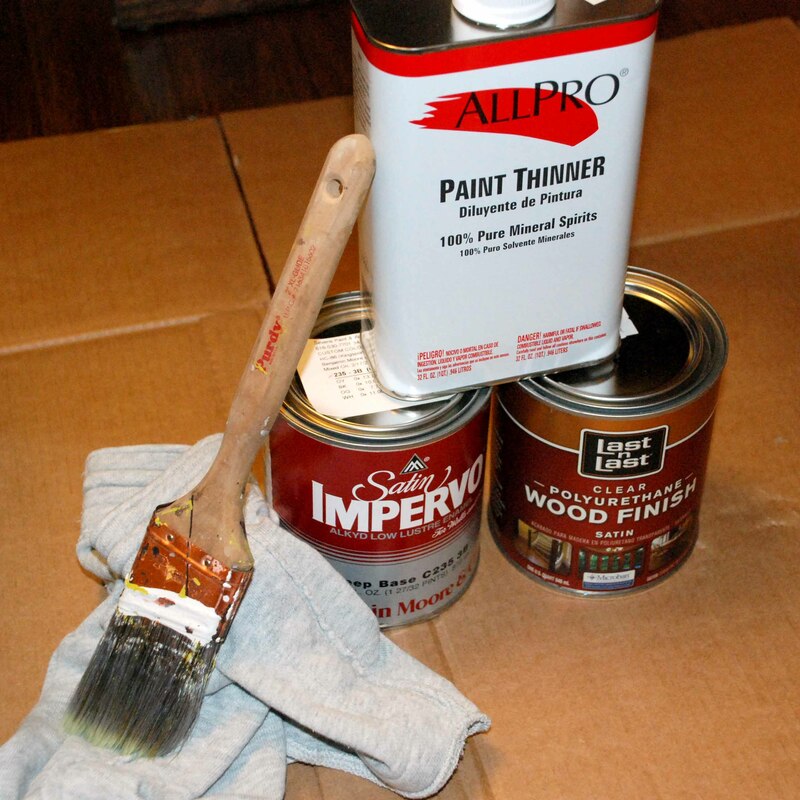 Then thin out the paint with the thinner, apply to the wood, and wipe! Apply how many clear coats you deem necessary (I usually do between 3-5), with sanding in between each coat with at least a 220 grit sandpaper. And put them in the spot you want, sit back and admire your hard work!